With Microsoft PowerPoint 2013, you can create and deliver your presentation to a crowd and make it informative, interesting, and dynamic to catch and hold their attention. 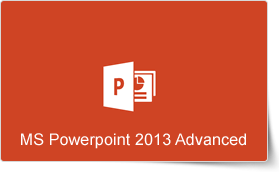 PowerPoint 2013 offers you a range of tools that can help you deliver attention-getting presentations. This Microsoft PowerPoint 2013 Advanced training course from PD Training is designed for students who have a basic knowledge of PowerPoint 2013. By taking advantage of this course, you will be educated on how to add text effects, insert SmartArt, format a table, add a sound and video clip, record audio and much more. This Microsoft PowerPoint 2013 Advanced training course can be delivered at your premises by one of our expert local or international trainers or live online using our HIVE technology.